Scott Montgomery is only kind of kidding when he says that his Truckee house, set on 5.3 acres, has been his job since he and his wife, Suzanne, retired from the Bay Area about four years ago. With their two children grown, the couple decided it was time to build their dream—an eco-friendly property where they could raise their own food. 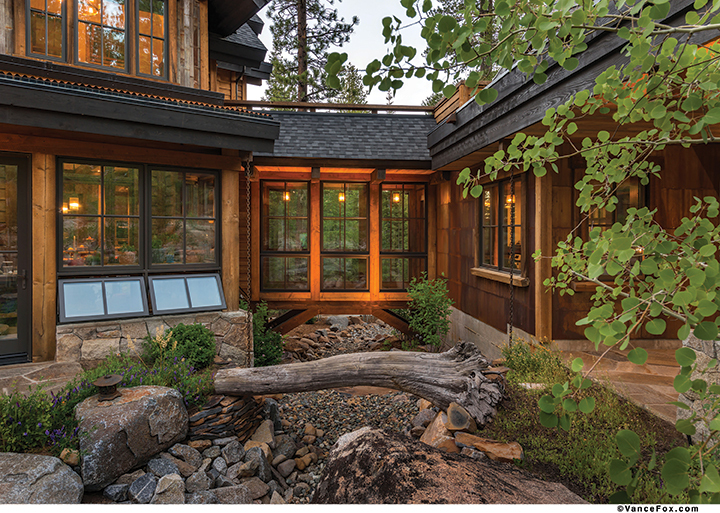 After seeing several houses designed by Truckee’s MWA, they contacted architect Kristi Thompson. The starting point was to orient the house, which was dictated by a wetland in the back of the property and a seasonal river created by spring snowmelt. In May of 2011, as the team was checking out the property, the river—located in the area where the home needed to sit—was about six or seven feet wide. “It emphasized the fact that we needed to make this really well thought out,” says Scott. Thompson modeled the home in order to maximize light and create spaces for all seasons while Scott researched extensively, trying to find the best and most innovative ways to create a sustainable home. The team didn’t actively follow green building guidelines such as the LEED program (knowing the house would have lost points for criteria like not being located near a bus station) or the Passive House Standard, instead selecting the best ideas from various systems. 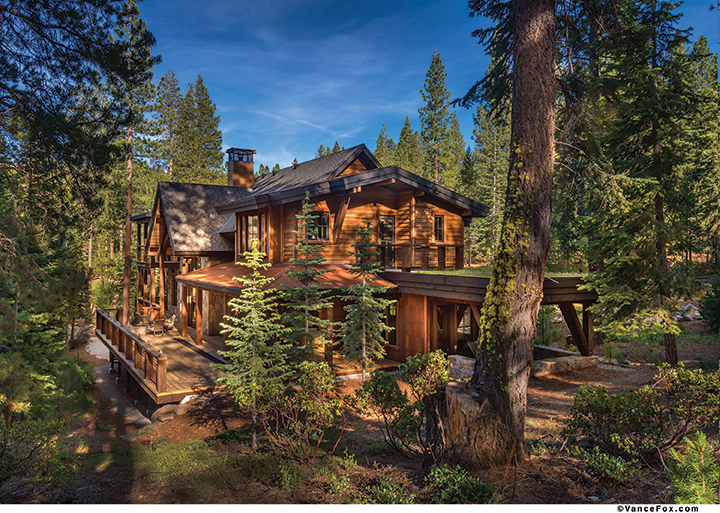 After about six months in design and another five to six months in submittals to Truckee’s planning department, the team, with Heller Construction, was ready to build. Construction began in summer 2011 and wrapped up in late summer 2013. Completed, the home’s list of environmental features is impressive: LED lighting, two ground source heat pumps powered by six 300-foot-deep wells, a 42-panel solar system on the nearby barn and three solar thermal panels on the house. Materials are mostly local and/or reclaimed. Trestlewood and picklewood are used extensively. The wall paneling came from a World War I armory on Lake Erie, while the window and door trim came from an Oregon granary. The granite is from Gardnerville. 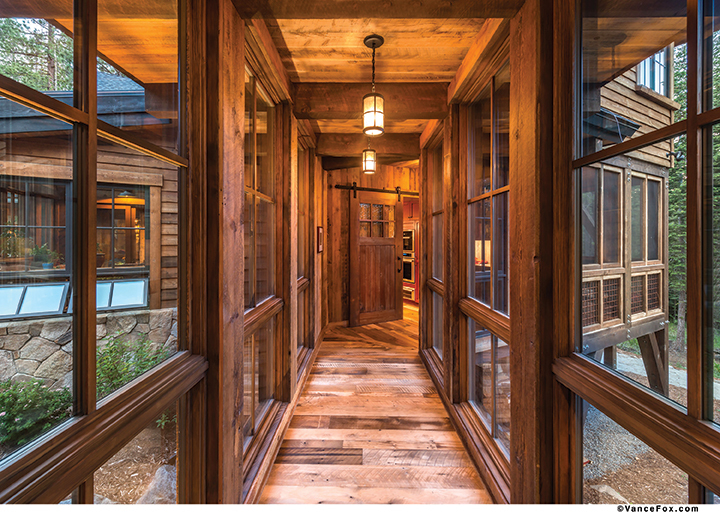 Local craftsmen were employed: Truckee’s High Sierra Custom Doors crafted the interior doors, while Heller’s crew added metal trim. Tahoe Vista’s Hunter Metal wrought the railings and the fireplace details. 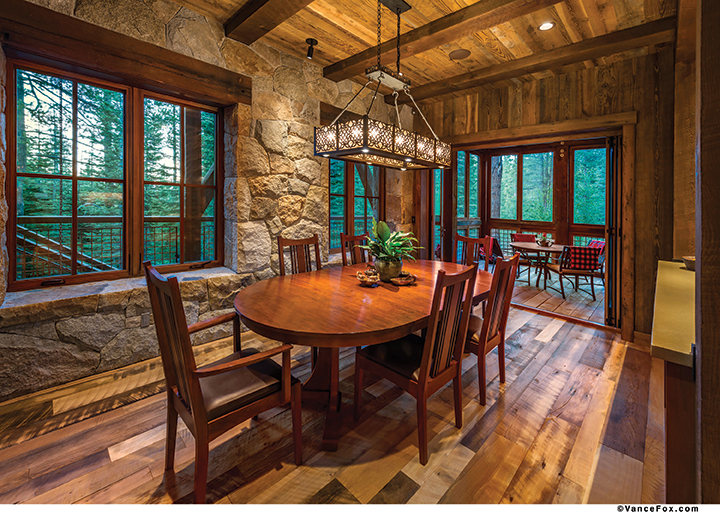 Tahoe City’s Ken Saling Masonry hand-cut the granite with mauls in an ancient, split-face method. Walls are almost a foot thick, allowing the team to use less wood in framing and more insulation. The R-value of most walls is R-21; the Montgomery residence boasts R-44. Likewise, the ceiling is rated at R-60, more than one-and-a-half times the R-38 that’s required. “We didn’t turn down any insulation,” says Scott. “With a rubber gasket,” Thompson adds. Because of the extra insulation, the team installed a heat recovery ventilator (HRV). “It brings fresh air into the house, exchanging ingoing and outgoing air,” says Scott. Fresh, filtered air silently circulates into bedrooms and public areas, and returns via bathrooms and floors. Perhaps the most impressive thing about the house is that, upon walking in, it doesn’t look like how one may imagine an eco-friendly house. 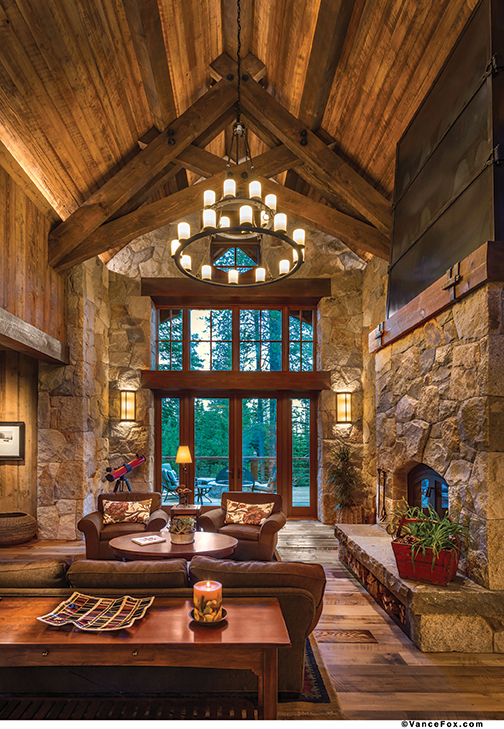 Nothing is stark or bare: The great room features a traditional Tahoe design—heavy trusses, granite walls and a large fireplace. However, this fireplace is a super-efficient wood-burning device that puts out enough heat for the entire house, and the surrounding seating area is perfect for viewing the entryway’s living wall and pond. “The wall is made of two levels of felt,” says Suzanne. “The front has a pocket. There’s a whole irrigation and fertilizing system, but it’s very easy to maintain.” The plants also clean the air, adding moisture and humidity. Past the living wall is a “guest” master suite, designed for aging parents or, as this is the Montgomerys’ permanent home, themselves as they grow older. There are no steps and no thresholds, not even into the shower or onto the private patio that opens to the surrounding forest. At the other end of the great room, the kitchen area is enhanced with various dining spaces—countertop dining, the nearby screened-in sunroom or the breakfast nook, a rustic wood-and-stone space that opens to the attached greenhouse that currently holds a variety of herbs. 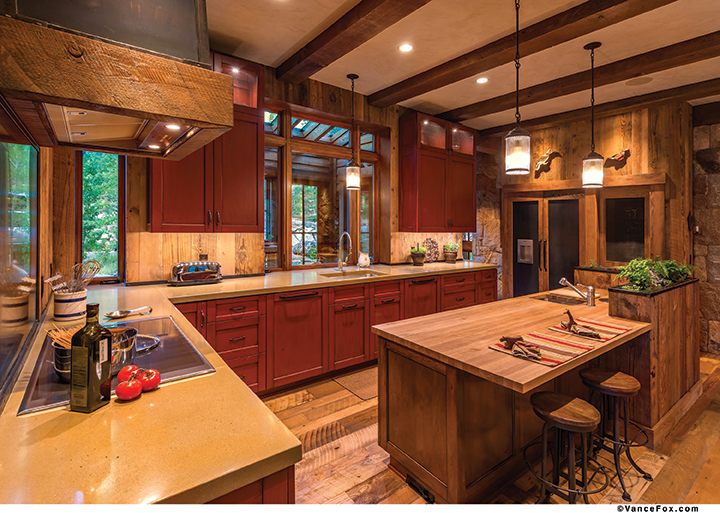 The dining area connects with the mudroom, laundry room and garage via a windowed bridge Thompson designed to span the seasonal creek, which the team enhanced with local stone and decorative natural elements to further direct water flow. “We’re controlling it so it doesn’t upset the foundations,” says Thompson. While the house is sectioned into 18 heat zones—which can be controlled remotely—temperature on the bridge fluctuates due to the abundance of glass, becoming colder in winter and hotter in summer. Sliding barn doors on either side of the bridge help to contain the bridge temperature. A workshop in the garage utilizes a dense rubber flooring the Montgomerys saw while touring the Truckee airport control tower. The mudroom leads to a dog run for the Montgomerys’ two dogs, Jasper and Lucy, and Suzanne had the idea to turn dead space under the stairs into a dog bathing area. The stairs lead up to the game room and a bunk room known as the Sierra Valley room. The pine walls were milled from on-property trees (which also supply the stairwell wainscoting) and finished with a beeswax polish. Both the bunk beds and corrugated metal ceiling are from the Sierra Valley, in the form of standing dead cedar and barns that were being demolished. The Montgomerys’ two grown children have their own rooms, which open into an airy common area. The north-facing bedrooms, which share a deck, each feature high transom windows (as does the blocky, shared bathroom), allowing light from the common room to filter through. 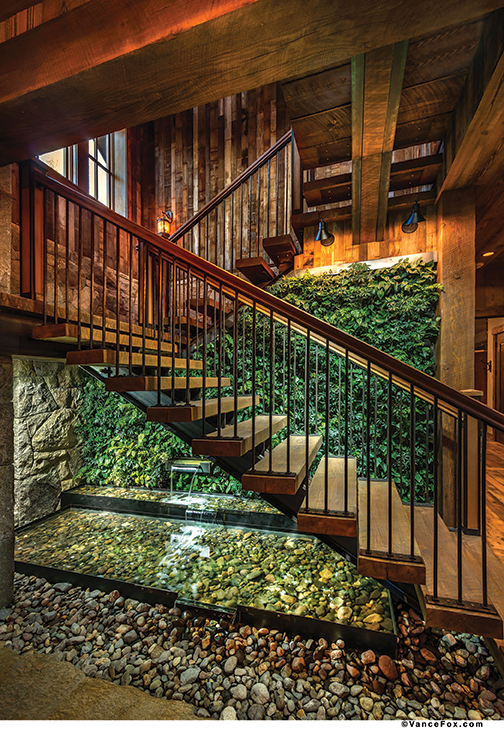 An interior bridge—the railing made of a California redwood from an Ohio water tank—spans the great room and leads to the upstairs master. The suite is luxurious—the walls are finished in Venetian plaster and the carpets are wool, with all-wool backing. “We don’t have a lot of carpets,” says Scott. 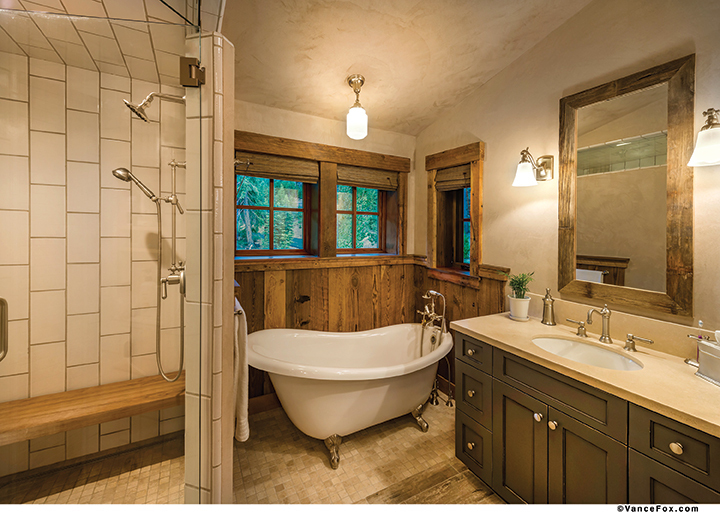 “Some carpets are so toxic.” The bathroom floor is a porcelain tile with an ink-jetted design to resemble wood planks, and there’s a large walk-in closet, a freestanding tub, an integrated steam shower and a heated towel rack. A personal patio provides views of the second green roof. A floating stairwell, the sides clad in picklewood, some of the boards still sporting stamped letters and numbers from their days as a pickle vat, leads from the second floor, past the ground floor’s living wall. Stairs continue down to the basement and all its “bells and whistles,” says Scott. Stark in contrast to the elaborate wood and stone of the upstairs, the basement is the control room of the house. A PC-based system acts as the brains of the home—monitoring and minimizing energy use—while 18 various pumps and tanks—from water tanks, pressure tanks and the HRV—provide the brawn. The basement may be Scott’s favorite room in the house, and he can provide detail on all the home’s mechanisms. For example, he can tell you that, though the tubes for the HRV are ribbed on the outside, they are smooth on the inside so that dust won’t catch. He kept his eye on LED lights for years, waiting for the technology to improve. He actively monitors energy consumption in order to minimize use, and along the way has discovered which Energy Star appliances exaggerate their claims. “We did our homework,” he says simply. The Montgomerys have future plans for a single-room space disconnected from the house—an off-the-grid yoga retreat, perhaps, or meditation studio. They plan to add chicken coops, put horses in the stables and are thinking about getting a goat. In the meantime, they enjoy sharing their home with green building groups and anyone who is looking to build sustainably. “The idea is to share info and get more people doing this kind of thing,” says Thompson.